Staying at a ritzy hotel on Amelia Island, I saw this eco-friendly lawn mower busy at work at lunch time. 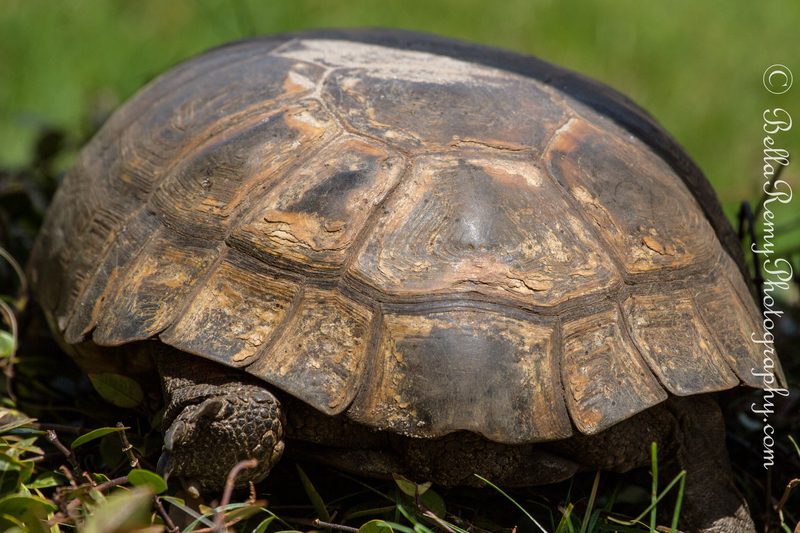 This Gopher Tortoise is a threatened species in Florida an is protected under law. A mascot of the Ritz-Carlton Hotel in Fernandina Beach, this turtle busily keeps the lawn trim while hotel guests frequently walk by. The sand dunes provide a buffer between the Atlantic Ocean and the hotels, condos and homes that enjoy being beachfront property. This strip of dunes provide a natural habitat for a variety of wildlife. A short walk along the beach was shared with several shore birds. One of my favorites is the Sanderling. Small and cute, these little birds dart in and out of the surf, looking for sand crabs for dinner. Taking their bills deep into the wet sand practically up to their eyeball, they work hard for their supper. 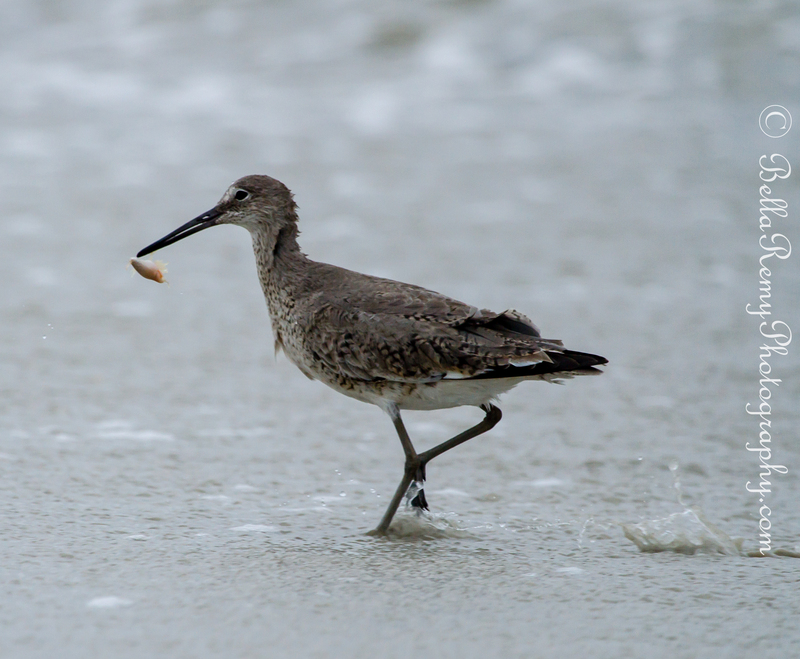 Along with these little darlings, a single Willet was joining in for the crab feast. 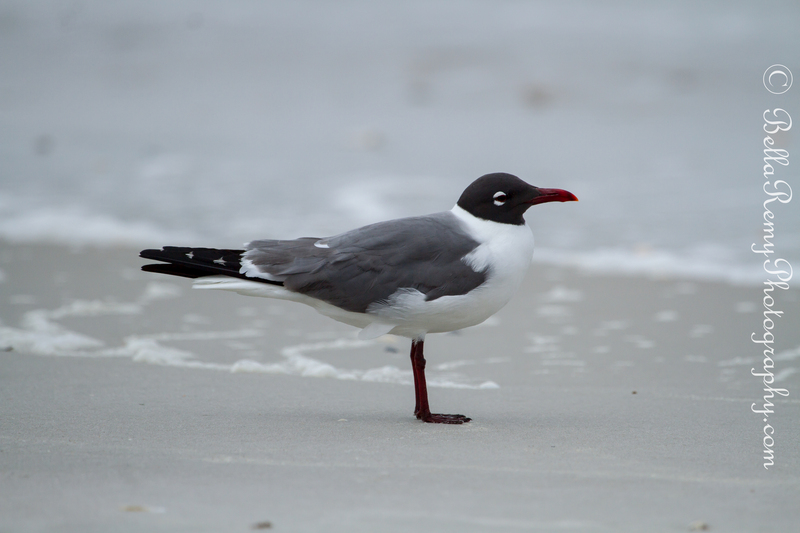 Meanwhile, this Laughing Gull and his friends had something to say. Must admit there is something about being a Smart Dressed Man. 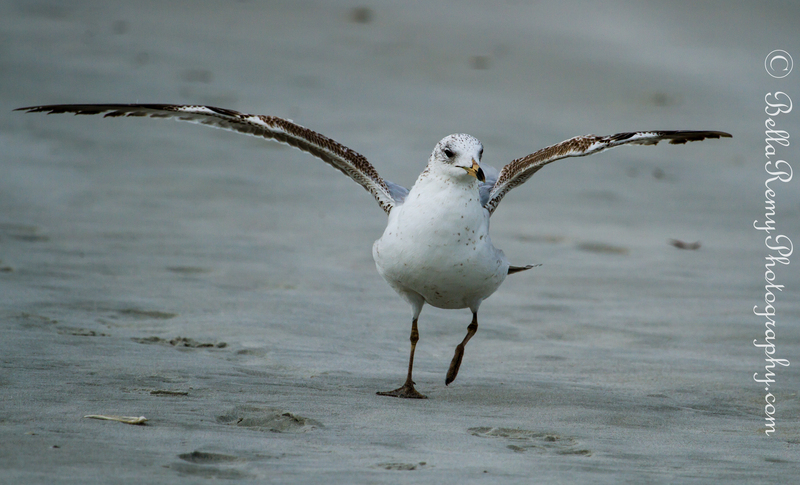 Of course, no sea side birding adventure would be complete without at least one gull to totally confuse me. They all look so similar. At least this one I do know to be a Herring Gull. Thanks Ali ! There were 25 mile winds, and overcast skies. Oh for better lighting and less wind. I think Rain is called for in the morning. Sigh..no sunrise. I agree..I know Feygirl can tell us how old he is. He was totally cool with the tourists. 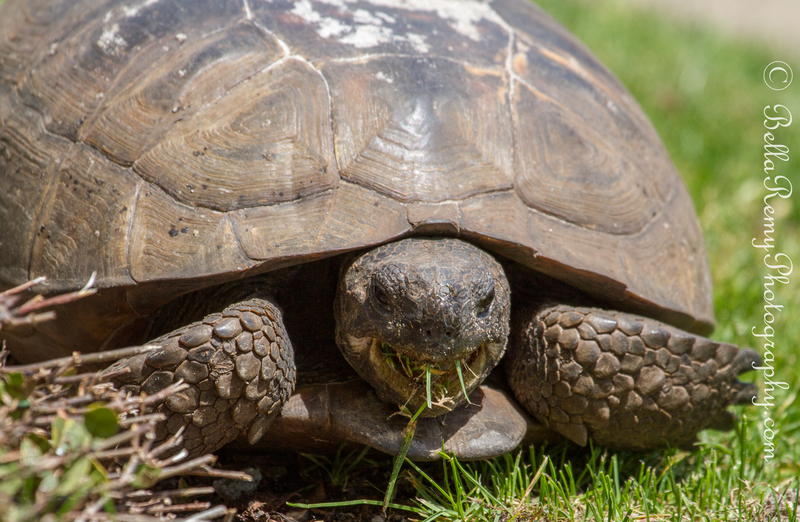 I don’t believe I have ever seen a tortoise used for lawn or weed management. We have companies in our area where you can contract goats to manage your lawn, but tortoises are unique, they would be fun to watch, but quite unique. I think this just happened naturally. It wasn’t done on purpose. But how cool is it? They have the goat rental in Maryland also. they can clear out quite a bit of land of plant debris. Thanks Charlie! Love the turtle… Too cute!!! Great shots!!! Thank you so much Rexlin. I wonder how long it takes the tortoise to trim the entire lawn? 😉 A nice selection of birds I have seldom seen, except for the herring gull of course. So happy I was able to share these birds with you Jerry. The turtle was full of personality, and I saw him quite a distance within an hour, so he does make some tracks. These are great! I love the turtle lawn mower 🙂 I’m green in that way as most of my lawn is clover. Thanks. Wonderful images, especially the first one. He was truly a character. He decided to go the other way after he saw me. Such fantastic pictures!! That’s one impressive turtle, great capture 🙂 And the sanderling shot is lovely, perfect colour tones and beautiful reflection. You are too kind Calee. With this wildlife photography, you have to take what you get. It was mid-afternoon and the light was hot for the turtle. But boy was he close. The birds later were in 20mph winds and cloudy conditions. Amazing what lightroom can do to brighten those images. Love the face on the big guy! They can live a long time too from what I understand. I think this guy is pretty old. We need Feygirl to tell us as she can tell from his shell. Lawn mower, eh, hm… that’s an idea. The sea birds make me want to go by the beach. Thanks for sharing your picture perfect day, Bella. I miss the beach so much as my visit was so short. I’d imagine your beaches are quite different. Probably more rocky? Thanks for visiting and always making me smile. I love the tortoise, what a great lawn mower, I could even use it, haha. I bet you can find some tortoises that will be more than happy to comply Leanne. 🙂 Thank you so much for taking time out of your busy schedule to visit, look/read and even comment. I truly am thankful. We have very strict rules here about where you can and can’t have for pets, I don’t think they would let me have one. 🙂 I love visiting you and seeing what you get up to. HAHA ! Bet they didn’t think of tortoise lawn mowers though. 🙂 Loop hole. You are too sweet my dear. Great bird shots, and the lawn mower wasn’t too shabby either. I enjoyed my visit to Fernandina Beach and Amelia Island some years ago and would love to return some day. Perhaps. Thank you so much Tom, you are too kind. So happy you were able to visit this magical place. My visit was limited to the resort, but what a fabulous place. Stunning! Especially the close-up of the tortoise and the sanderling reflection! These are fabulous photos. 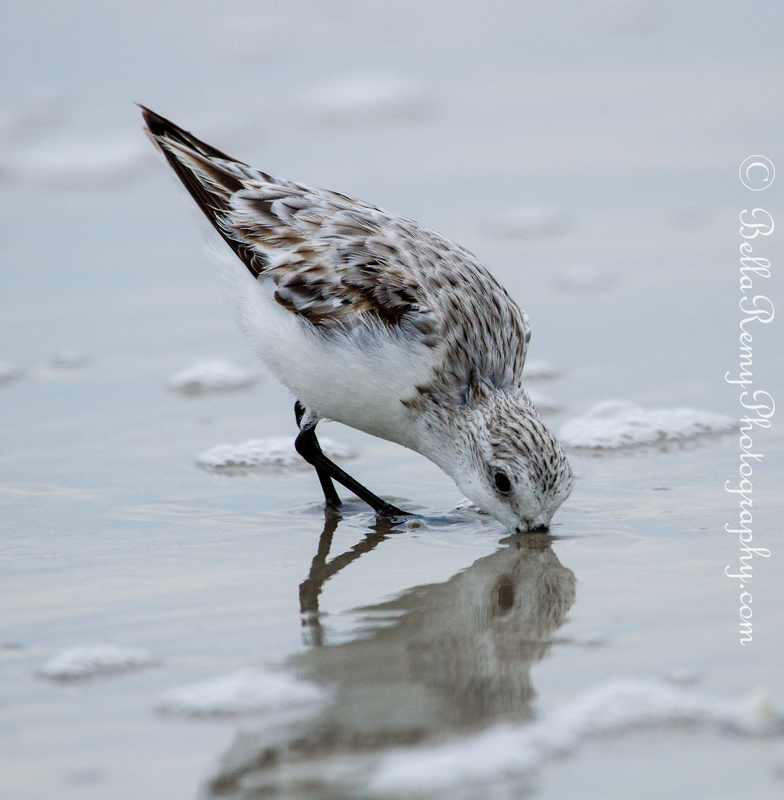 I love the sanderling with the reflection. So steal mine ! Want one without a watermark? omigosh you’re the sweetest thing EVER. are you sure? it’s for a kids’ project i’m putting together for the everglades. well, hopefully at least. i would credit you!! right now i haven’t even been able to query anyone, because of my tortoise hold-up, hahahahah!!! but if you’re SURE you don’t mind, yeh, one w/o a watermark would me amazing! you’re a gem. a jewel. a queen!